The occasional blogger – Page 3 – Sometimes I have time to write…often I don't! If I managed to write as many blog posts as I compose in my head then you would all be sick of me. That said, today I have a little time due to having a sleeping Sam on me. This week we have discovered one of the hardest moments of parenting: looking after your child when you’re both ill. It has been a hard few days. Our little angel first showed signs of being a little under the weather on Sunday morning when, on the only morning Carl was not home, he was sick as I lifted him out of his bed. Babies are sick though, it’s part of what they do, so I gave him the benefit of the doubt. Bringing him into our bed for a cuddle and a feed, all was well until he projectile vomited all over himself, me and the bedding. Wash load on by 7.45am. I’d often wondered how you would even know if a baby is sick as opposed to simply ‘being sick’. Well, in the words of the many women who said this to me about labour, “oh, you’ll know”. It was grim. After a couple of vomit attacks, I phoned NHS Direct, concerned that he would quickly become dehydrated. They advised a doctor’s appointment to check he was ok. 3 hours later, the very specific and not at all vague diagnosis was that it was ‘a virus’, so nothing to be done but wait it out. He kept lunch down, but dinner made a reappearance. We had a rocky night and then all improved; happy and bubbly, kept breakfast and lunch down, managed a trip to Crawley, brilliant. At around 4.30pm though, I started feeling unwell and – unbeknown to me – so did Carl. By the time he arrived home an hour later, we were both feeling significantly ropey. He was the first to succumb while I barely managed to hold it together, which became all the more difficult when Sam’s dinner revisited us and he projectile vomited more food than I knew he could fit in him…all over himself, me and his carpet. It was a true exorcist moment and I felt so sorry for him as he started crying with the shock of what had happened. It was a bad night for Carl and I. Luckily, Sam slept until about 5am but we barely slept all night, feeling feverish, sick, hot and cold. I hate being ill. The next day was hard work as we both struggled to muster any kind of energy and tried to be a semi-decent parent, since Sam still wanted to stand, walk and play. However, he can’t have been feeling 100% because each time we needed sleep, we took him up, I fed him and he also crashed out. Thank goodness for Mum coming round after work and injecting some fun and laughter into his day. That was Tuesday. Today we are both finally on the mend and Sam is happy and energetic as anything. Everything has been cleaned and we’ve learned a lesson about being blasé when he has a stomach bug and then shoves his fingers in our mouths. I’m finally posting this, a mere 8 hours after I started it, but at least I’ve managed a post! I have neglected you recently, although you’re often in my thoughts. At the moment I’m very busy and don’t really have time to sit and write regular or interesting posts, which is a shame because Sam is moving forward in leaps and bounds. You were here for me in the early days when I was awake multiple times during the night or stuck under a sleeping baby during the day. You helped to keep my brain active by writing, rather than inanely scrolling through Facebook or playing bejewelled. Now Sam sleeps through – often for 11 hours – I don’t often find myself awake in the early hours. He sometimes naps in his cot, so I can get on with odd jobs. I haven’t updated you on anything recently. He’s trying to walk now. Beginning to cruise. Even able to stand (briefly!!) unsupported. These are all milestones I should be writing about. Laughing about his fascination with one of our side tables, preferring to try and reach that rather than any of his toys. Sharing the photo where he wanted to feed himself during a particularly happy dinner time. 5 seconds later he had the spoon in his hand and yoghurt in his eye. So many little moments that we photograph, film and treasure, but don’t share with the world. These are OUR moments. I do miss you, Blog but I’m living the moments rather than recording every one of them. I will try to write once a week or so. I am doing many things at the moment but these posts only take a few minutes, so although I’ve lost my mojo a little, I will continue. Recently, we have started trying to give Sam the bottle during the day, so I’m only feeding him first and last thing (although I often have to feed him to sleep before his morning nap, if we’re at home). 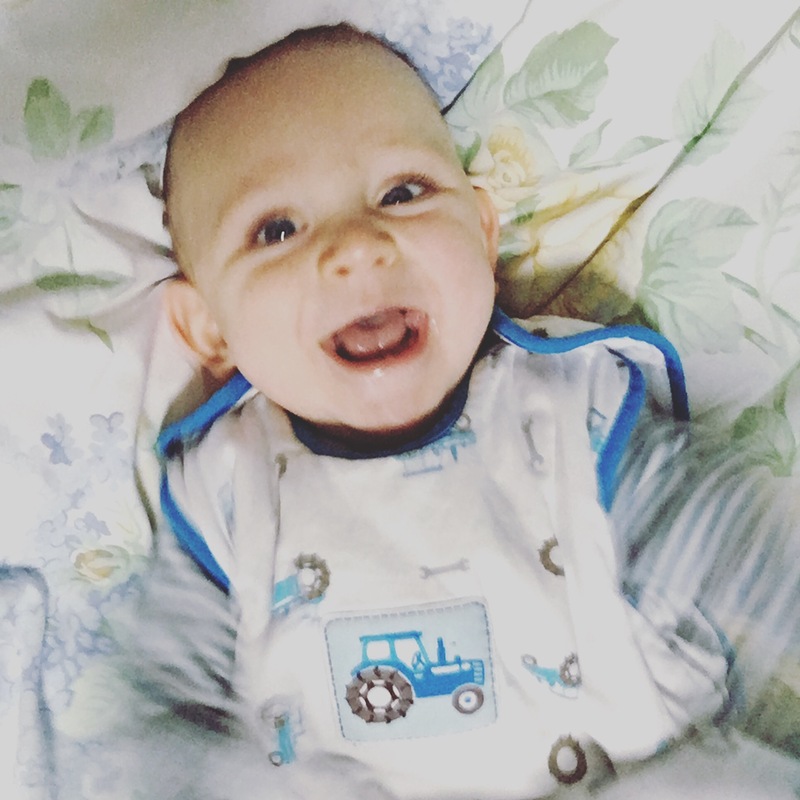 With a busy December coming up, I’m not always going to be home for bedtime, so we need him used to taking a bottle and then going to bed without a breastfeed. 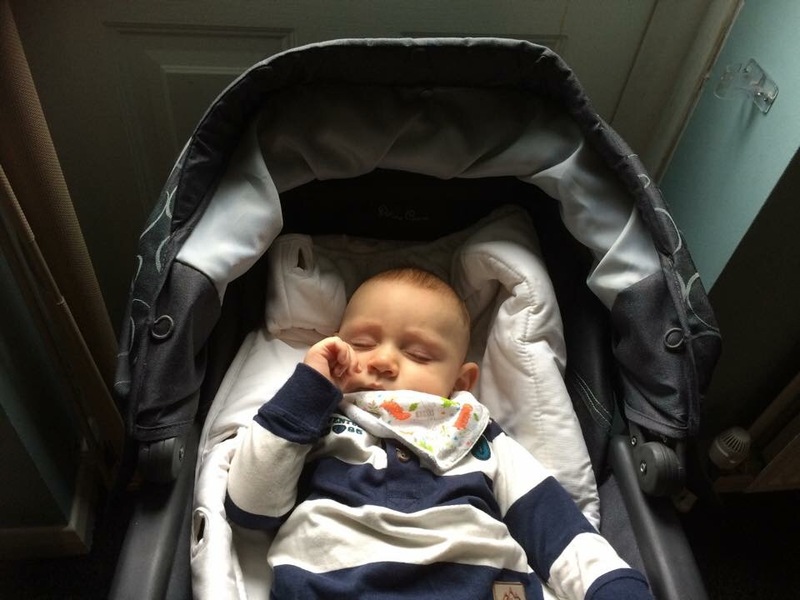 On Sunday night, he was fussing and wouldn’t be rocked or fed to sleep…so I put him down and went downstairs. He cried for maybe 2-3 minutes and then rolled onto his side. Unbelievably, he then went to sleep. On Friday, despite being at a friend’s house he had also managed to fall asleep on his own, after lying staring at the camera for 15-20 minutes without a sound. He’d refused to fall asleep feeding and cried continually when Carl rocked him. So the upshot is that we know he is perfectly capable of falling asleep unaided, if all the stars are aligned and he feels like it. Monday night was the worst in months (thank you top teeth) so it’s not something we can rely on yet. However, we know it can be done and have a few weeks to work on it. Now that I’m rarely breastfeeding while out and about, today I’ve taken a brave step. I’m heading out without nursing bra or an easy feed top. Monkey Music and then lunch with Carl, so there’s no reason why I would need to feed him but it still feels a bit daring. How nice to be in ‘normal’ clothes during the day! (Obviously I have done this when I’m out in the evening). I might dig out a pair of nice boots to celebrate. On Friday night I went out with a three of my girl friends. We popped into the local wine bar and I had a lovely glass of bubbles. Much deserved and savoured! Over tapas and more wine (for them) we laughed and talked and laughed and gradually got louder and louder, as only a group of women can do. Luckily the bar held the sound pretty well so we weren’t echoing off the walls…too much! After dinner, the cry was to go a couple of doors down for a dance. Carl had text letting me know that Sam was still sleeping (with a photo of the monitor screen to prove it!) and told me to relax and have fun. Although I resisted the girls telling me to get a taxi home rather than drive, I did have pretty shoes on and pretty shoes need a dance floor!! Off we went, to find we were the only people in there. Who cares!? 4 girls and 1 dancefloor; we were happy. As we boogied away, I realised that it had been a long time since I last had a night like this. Even though I had a good dance at our Christmas party, I was 7 months pregnant and unable to bust out some of my best (worst) moved. I needed Friday. I didn’t even realise it until I was out and laughing and dancing with the girls. To go out with people who knew me before I was pregnant, who I used to see all day every day and laugh with all the time…well, it made me feel wonderful. It was up there with Kate’s burlesque birthday party in the summer. Sometimes, as much as you adore your children, you need a couple of hours ‘off’ and to be ‘you’. Not so-and-so’s mum (or dad!). I wrapped up my night at about 11.30pm and set off home. Sam was fast asleep, but Carl’s evening had been tricky. He’d woken 15 minutes after I left and it was 2 hours before he settled again. Luckily, with Carl’s perseverance, patience, rocking, trying to put him down, hugs, offering the bottle, Sam had ‘eventually’ fallen asleep on his own. When he woke an hour later, he cried for a few minutes and fell asleep on his own again. This is very new. It happened for the first time on Thursday night when we’d left him for a couple of minutes before Carl went up to settle him…but Sam fell asleep before he opened the door. Maybe he is beginning to learn to fall asleep on his own, without us doing any ‘sleep training’, leaving him to cry or anything else. He’s 8 months old now and maybe he is simply starting to get it. Roll on December, when Carl and I have our Christmas party and a night out together…watch out dancefloor!! Today has been quite a day. This morning was Sam’s trial session with a childminder, while I went to choir. I felt sick as I drove him to Claire’s. We met last week and I felt perfectly at ease with her; Sam was happy enough playing and being held by her and we got on well. However, I’d still only met her once and leaving your child with anyone is a huge deal. Especially when your child cries with almost everyone. Of course, Sam decided today would be a good day to reject a morning nap. He didn’t feed to sleep, he didn’t doze off in the car. So by the time we arrived, he’d been awake for nearly 3 hours and would soon turn into Mr Grizzles. He was content enough playing on the floor although he started grizzling just before I left. Walking out of the door was one of the hardest things I’ve done. Barely managing to hold back tears, I text Carl for some reassurance that this was the right thing to do, and set off for choir. When I collected the little man, he was crying (as expected) because he was hungry and tired and had refused the bottle. However, it said it all that he had a quick feed, calmed and then returned to gurgling and smiling at Claire. As she phrased it, the session hadn’t been without issue, but nothing that can’t be overcome. She took him for a walk when he got upset, and he had a 20 minute nap in the pram (he’s never slept in a flatbed/carrycot pram before so that was good). He’d refused lunch, but happily eaten his yoghurt. It’s a start. He’s going to hers again on Monday (since she can’t do Thursday) to see how he is then and very probably book him in weekly thereafter. Tell you what, if leaving him for 2.5 hours means he’ll always be so smiley and huggy afterwards, he can go every day! He kept looking at me and beaming, then went in for a hug. I spend all day every day with him. Today he masters a new skill. Obviously, in the 2.5 hours he’d been out, he mastered clapping and oh my goodness was he proud of himself. Clap, clap, smile, clap, smile…all afternoon! When Carl arrived home, Sam eagerly showed off his new skill by clapping lots and lots, all the while beaming. Carl spent a bit of time with Sam while Mum and I did a bit of sewing (how very stereotypical)…5 minutes later Carl comes in; “he’s done his first step!”. I miss the clapping. I miss the step. But how? He can’t even stand on his own!! Turns out that he can, as long as he’s up against the sofa corner (we have a corner sofa). It’s not 100% unaided, but he doesn’t lean back on it much. Carl reached out to him and – after a fair amount of encouragement and some frustrated crying from Sam – he did indeed step forward and into Carl’s arms. He’s also been making much more of an effort to crawl today. I have a feeling that life is about to get a whole lot more interesting….and harder! It was only around 2 weeks ago that Sam began consistently sleeping 10-11 hours a night. It was a magical time. Evenings were adult time, I didn’t have to get up in the middle of the night. Last weekend, Mum and I set off back to Wales for the weekend to see my grandparents again. Sam surprised me by settling into the cot there for the first time and sleeping up to 7 hours straight (even if it did take over an hour to get him to sleep one night). I had a whole double bed to myself although I, of course, ended up curled up hanging off one side of the bed. Then, on Saturday a little tell-tale sign of things to come. The return of the drool. After the drive home on Sunday, it took a while to settle him but that was to be expected; he hadn’t seen Carl in 3 days and was overjoyed to see him. However, over the last couple of nights he has started waking more frequently again and last night he woke at 10.35 and took an age (1.5 hours) to get back down again. He then slept until 6.30am but the cats decided we were missing the 5am wake up call and turned feral at that time to ensure we woke up. The grim green nappies have returned. The chewing is in full force. His sleep is once again unsettled. Hurry up tooth number 3!!! What amazes me is how quickly I’d forgotten this! His first 2 teeth came through and settled a month ago and suddenly his sleep (to name the biggest change) really came on leaps and bounds. When he woke on Monday night, I looked at the phone, hoping it was after 5am so I could bring him in with us (my/our ‘rule’). I was totally shocked to see it was 2.30am. 2.30am!? My baby doesn’t wake in the night! Oh wait, for 7 of the 7.5 months of his life, yes he does wake at night. I don’t often do this since Sam is too much a fan of both free wees and poos, to poor Carl’s delight (disgust) most mornings. However, since he is generally sleeping for longer periods at night he is now wearing a nappy for a very long stretch nearly every day. Therefore, I decided that it’s time to re-introduce naked playtime. Down went the foam mats with a towel placed over the top. In the nappy change beforehand, I – successfully – did plenty of bicycle moves with his legs to encourage a ‘clear out’. The hope being that he would be less likely to ruin playtime. Downstairs to the dedicated area and off came the clothes. He looked happy as anything about this! Now, I had long wondered whether he does a little shake of his whole body when he’s excited…or when he does a wee. I can confirm that it is the latter. Fortunately, thanks to all my planning I simply moved him to a different area of the mat and we continued playing. We had a great half an hour or so! He was happy as anything – typical boy. I probably could have left him longer but I didn’t want to get over confident and have anything worse to clear up!! Back into his clothes and into the jumperoo for a bit bounce around before dinner. As usual, Sam went to bed at 7.40pm after the usual feed to sleep and waking after 25 minutes, before being fed to sleep again. Carl and I had a lovely evening with a glass of wine and generally put our feet up. We never learn, so it was gone midnight by the time we finally went to bed. At 4.45am we heard Sam wake and start fussing. Shattered, we didn’t move. After 5 minutes or so, he went back to sleep! He then slept again until 6.05am. Why didn’t we go to bed early to get a decent night’s sleep!! Goodness me, I never thought this would happen. As ever, I accept that it may be a while before this occurs again but, as I always say, it shows he can do it. It must be said that I was about to explode after such a long time between feeds… obviously, he had a huge feed when he woke, thank goodness! The sun returned yesterday and since Sam decided to be awake all afternoon, we wandered down to the park for a change of scene. 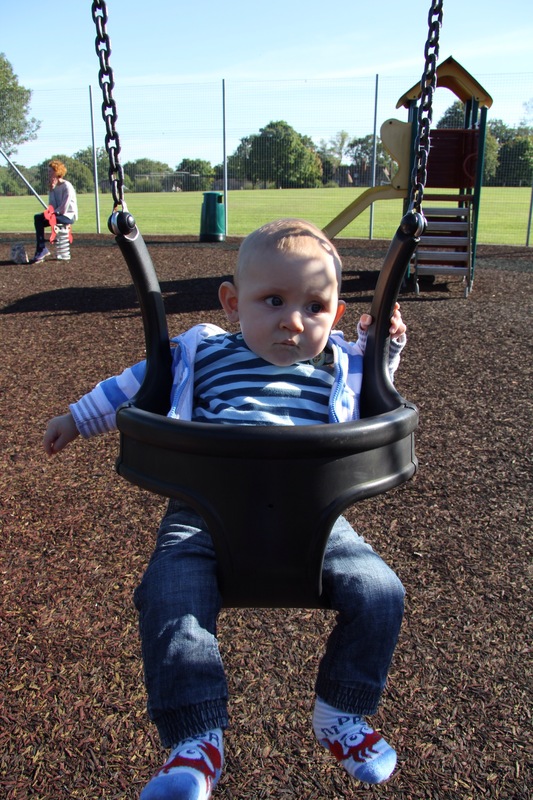 The major advantage of Sam sitting so well is that he can have a go on the swings, have me hold him on the slide, or simply play on the ground! As he sat in the swing, I pushed him gently, all the while smiling encouragingly and saying inspirational things like “Boo!”, “You’re on a swing!” and “Look how grown up you are!” In return, I received a bored look and him turning to watch the other children play. Ouch. Slapped down by a 7 month old. Off camera, he was much more smiley (honest!) but he had his ‘aloof’ model face on whenever he saw the lens pointing his way. 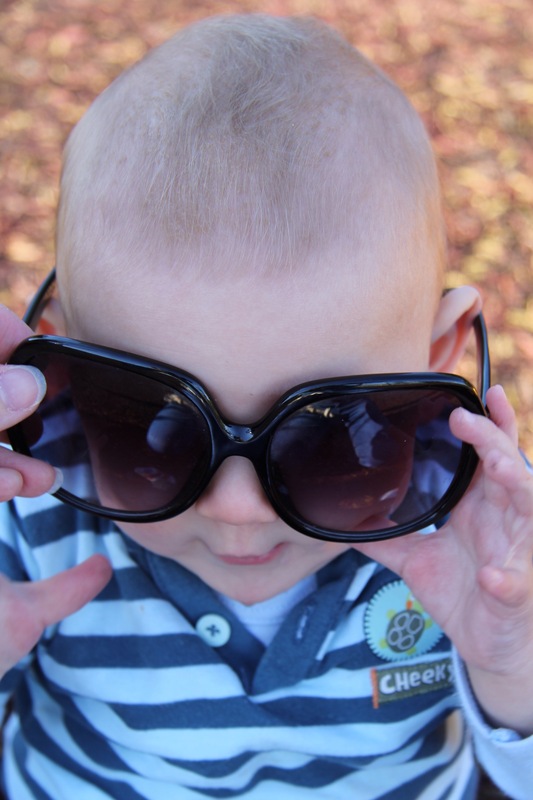 When you have a baby, putting them in your sunglasses is obligatory. While playing on the ground, Sam grabbed and started playing with them. I took the hint and popped them on him. He wears them well I think! All in all, we had a lovely time at the park. We enjoyed the sun, had a needed change of scene and established that Sam is already dismissing everything I say.